It is primarily intended for use in welded pressure vessels where notch toughness is important. These grades cover a range of tensile strengths from 55 – 90 MPa and this versatility explains much of the specifications popularity. ASTM A516 specification steel is used throughout the oil and gas, chemical and power generation industry and can be tested to exceed your specified requirements. HIC Testing is one such requirement as this material is used commonly in sour service/ wet h2s corrosive environments and so knowing how susceptible the material will be to hydrogen sulphide corrosion is imperative. In many cases the stringent requirements of engineers and designers require much greater controls than this and these are in part provided by a specification called ASTM A20 or ASME SA20 (Specification for General Requirements for Steel Plates for Pressure Vessels). This specification outlines the testing and retesting methods and procedures, permissible variations in dimensions and mass, quality and repair of defects, marking, loading, and ordering information. It also contains a list of supplementary requirements which can be added to the basic A516 / SA516 specification when additional control, testing, or examination is required to meet end use requirements. The supplementary requirements in A20 / SA20, there are seventeen of them, are designated numbers (S1, S2, S3, and so on) and cover things like ultrasonic testing (S8, S11 or S12 depending on the type of ultrasonic test), charpy v-notch impact tests (S5), and product chemical analysis (S2). The most important thing to know as a potential customer of Steber Steel is that we stock, process, and distribute all of the popular grades of Boiler and Pressure Vessel specifications like ASTM A516, ASME SA516, EN 10028-3, and BS 1501. You may call the steel whatever you want and leave us to worry about matching our stocks to your requirements. A516 Grade 70 Steel Plate is sleeved into plastic bag individually, pieces wrapped with water-proof material, bundled with nylon rope. Clear labels are tagged on the outside of the package for easy identification of the quantity and product I.D. Great care is taken during operation and transportation. A516 Grade 70 Steel Plate packing will be according to international standard in bundles strapped by strips then into containers to avoid any damage. – End of A516 Grade 70 Steel Plate protected by plastic Strip. We export A516 Grade 70 Steel Plate to Iran, Iraq, Oman, Qatar, Albania, Muscat, Bahrain, Turkey, Egypt, Maldives, Italy, UAE, Bahrain, Indonesia, Australia, Kuwait, Saudi Arabia, South Africa, Germany, UK, Denmark, Canada, USA, Peru, Brazil, Nizeria, Mexico, Venezuela (Latin America), South America, Russia, kazakhstan etc. Steber Steel is a well known worldwide exporter of A516 Grade 70 Steel Plate, Steber Steel is committed to provide each and every customer with the highest standard of customer service. 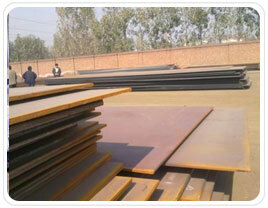 We deals in A516 Grade 70 Steel Plate in India & Overseas, offering a wide range of A516 Grade 70 Steel Plate.